Having a large chunk of Incense Cedar that was highly cracked, very dry, full of holes and not knowing what to do with it, I decided to make a bowl. I band sawed the best pieces I could from it and glued them together. I then used a forester bit to take some material out of the inside. 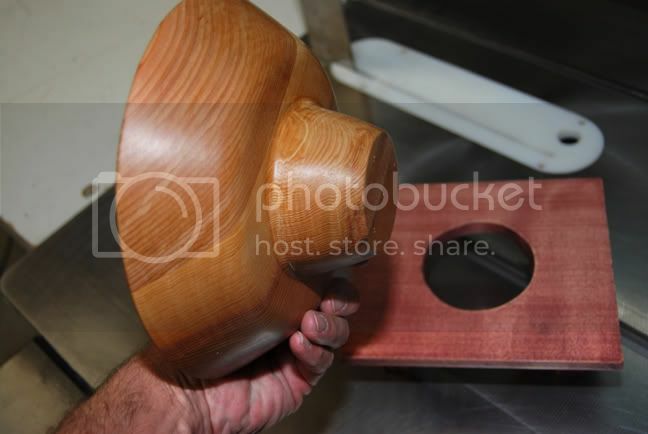 A sanding/grinding disk was used to finish roughing out and shaping the inside then a drum sander attached to a drill motor was used to smooth out the wood. Next I used the band saw with the table set at an angle to cut way the outside and generally shape the bowl; this is where everything started to become a major bummer. After I took the bowl from the band saw and set it on the work bench it fell apart, one of the cracks had let go. I glued the pieces back together. After smoothing the outside of the bowl with the belt sander and a lot of hand sanding there was a nice looking bowl. …but an idea popped into my head that a decoration would look good on the outside of it and so to the router table and a nice sharp dove tail bit. The idea was to put some rings around the bowl but instead the bowl slipped while routing and gouged it badly. Bummer! Ok, now what. I then decided to reshape the outside of the bowl and take the damaged wood off. I flipped the bowl upside down and used a hand router with a bearing pattern bit. Everything was going well until I caught something and jerked the router which tipped it and I could feel the bit dig in and so I jerked the router which made it bounce on the bowl then dig in a couple of inches away from where it was digging in before and tore a huge chunk of it and flung it across the shop. I just stared at what was a nice looking bowl that was now really messed up. I looked at the bottom of the router and the base was missing. Opps, I forgot to put it back on after my last project. Ok, now what? Oh I can hand shape the bottom half of the outside with a Shinto rasp and make a stand for the now much smaller base to fit into, a sort of oriental looking thing. More cracks showed up and had to be filled with epoxy. The bowl turned out not too bad but still ugly. The stand, made out of alder, was a beautiful cream colored delight, but it really needed to be black. I read somewhere that ink could be added to varnish and used to blacken wood so I did it. The wood turned a blotchy purple. Ok, I’ll just let it dry and varnish the bowl. I then sanded the bowl with 400 grit sandpaper and applied the varnish, it blotched also. Nothing I could do would make either the bowl or the stand pretty anymore so after several coats of Varathane, I now have a finished “ugly bummer bowl and stand”. Turned out to be very nice bowl. My first impression this bowl was your turning product. Sounds like a very dangerous use of the router and other tools. A lathe would be a much better tool to make a bowl. Very nice looking bowl and stand. Good save. Ain’t it like us to point out all our mistakes and miss the beauty of what we make. That stand looks like purpleheart. Great job. MickeyD that’s an even better photo! Thank you sweety! “You replied with thank you sweety” Sounds like you are whipped. But again aren’t we all! socalwood – The bottom of the bowl goes through the stand about half way down the small part of the bottom and just sort of looks oriental. Coloneldon – If I had a lathe I most likely would have used it but then again I did learn much doing the project this way. I do not push the envelope on safety but I will gladly and with ernest try something out of the oridnary, success or not. Big_Bob* – The lady of the house carries a big wooden whacking spoon! ...and sees colors I don’t! A really pretty and unusual bowl which will make a good story for years to come. However, after hearing your story I will definitely stick with my lathe.